I have taught introductory NT courses just about every semester of the last five years, and a few times I have taught a survey course on Paul. I have very happily used Michael Gorman’s Apostle of the Crucified Lord, which blends historical, literary, theological, and reception approaches in an accessible and informed way. 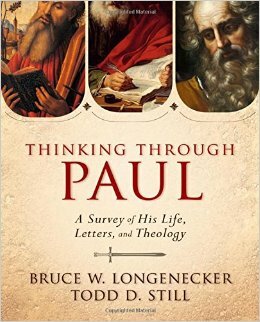 Another very attractive option for an introductory course on Paul now is Bruce Longenecker and Todd Still’s new textbook on Paul called Thinking through Paul: A Survey of His Life, Letters, and Theology (Zondervan, 2014). Longenecker and Still have interests and expertise that complement one another and both are highly respected Pauline scholars. And Zondervan has just about mastered the art of textbook production. (1) Balance – good introductions help students see different angles and better understand where scholars are divided on interpretive issues and why. (2) Visuals/Sidebars- charts, pictures, maps: lots of visual appeal in this book. Also, they sprinkle quotes from scholars in sidebars, often very engaging and interesting information in these. (3) A dedicated “theology” set of chapters – the last three chapters of Thinking through Paul are focused on Paul’s theology. Too often, surveys simply plod through the Pauline letters and note historical and exegetical issues. Even though this is necessary, students can feel a sense of disappointment that they did not get a chance to better understand the big picture of Paul’s thought and theology. Longenecker/Still really shine in this area (as does Gorman, of course). You can find a sample of the textbook here. Last thing: I appreciate that Still and Longenecker dedicated the book to their mentors: Jimmy Dunn and John Barclay – two men I hold in the highest esteem. Very cool.